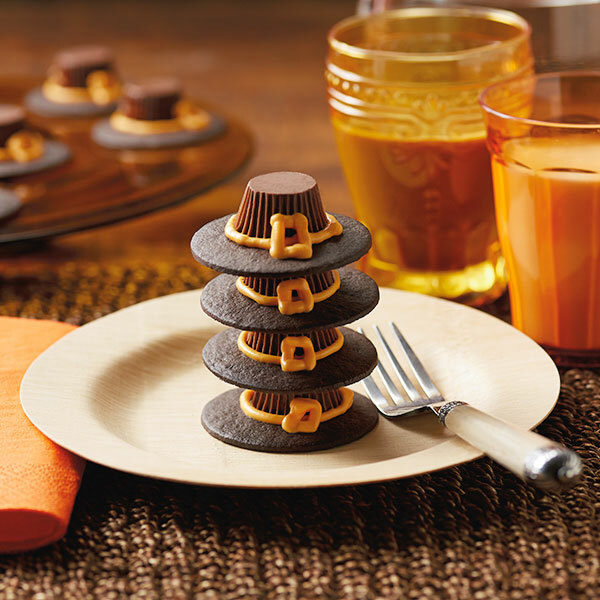 Thanksgiving Pilgrim Hats Peanut Butter cups are perfect for your gatherings with family and friends. This Thanksgiving dessert recipe features miniature peanut butter cups, chocolate wafer cookies and icing. They’re easy to assemble and even easier to enjoy. If you’ve been looking for creative Thanksgiving dessert recipes, then this chocolatey treat is exactly what you need. Tint your frosting orange. Transfer orange frosting to a decorator bag with small, round decorator tip. Place a small dab of frosting in the center of a chocolate wafer and “glue” a miniature peanut butter cup, upside down, to the wafer. Draw a band of orange frosting around the base of the peanut butter cup and add a square for the band buckle. Serve them after your Thanksgiving dinner (or place on your guests’ plates as a pre-dinner treat).